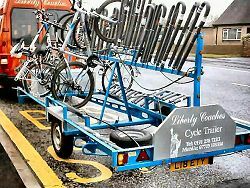 Mini-coach hire with option of a trailer carrying up to twenty-four bicycles. Timings and pick-ups to suit your group’s needs. Mini-coach with luggage trailer also available.